Copyright 2013 Kelly Smith; all rights reserved; content may not be copied, rewritten, or republished without written permission. Posted December 19, 2013. 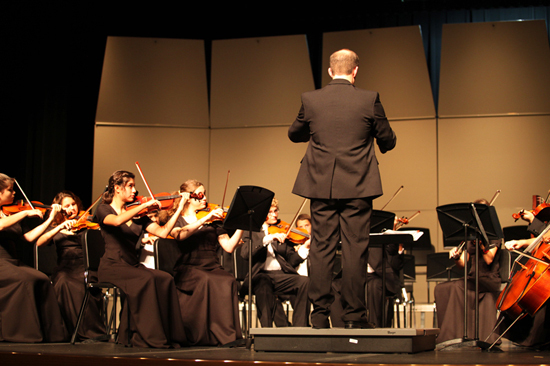 The following three videos were taken of the recent Winter concert. Pardon the herky-jerky nature of the recordings; I was using my Canon point-and-shoot camera while I continue my battle to compel the extended warranty company to fix my good camera. The orchestra is composed of the chamber, the philharmonic, and the symphony. The first video below features the chamber orchestra performing Bacchanale, composed by Saint-Saans, arranged by Porter. Enjoy. The video below is a presentation of Dance of the Reed Flutes by Tchaikovsky, arranged by Story. This is where the conductor pulls out all the stops and brings in the choir, some percussion, and more. These selections are from Home Alone, composed by the great John Williams.